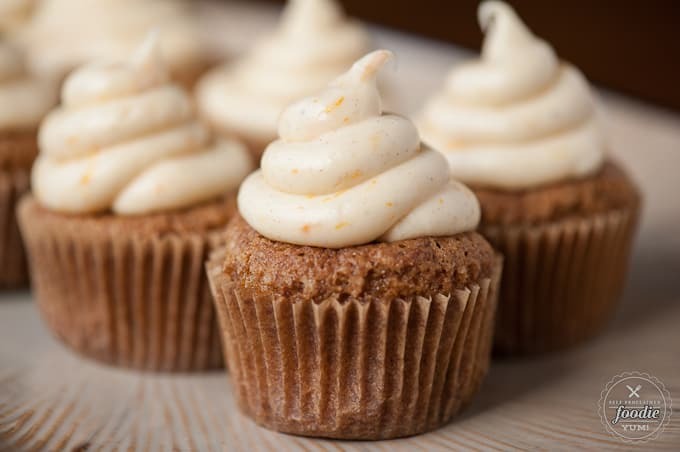 These Carrot Cupcakes with Orange Spice Frosting are the most moist and delicious carrot cupcakes you will ever enjoy and the frosting is unbelievably good. Oh man, these cupcakes were good. No, they were great. Scratch that. They were freaking phenomenal. I made them because we had some new neighbors move in and I wanted to welcome them to the neighborhood. Well, it appears we’re not that great to live next to because the cupcakes turned out so damn delicious that we wanted to keep them for ourselves. 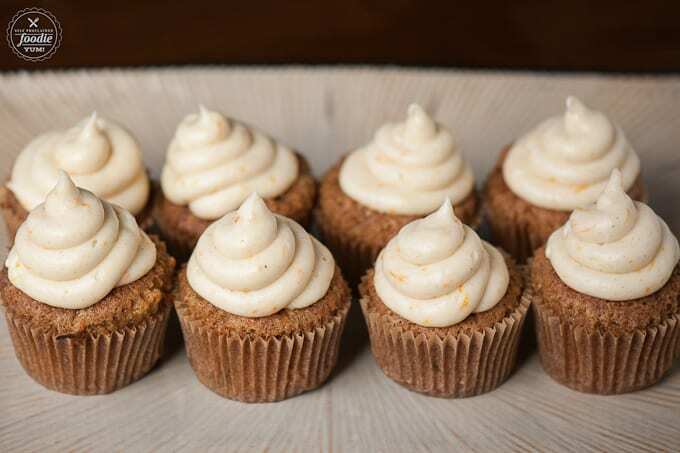 I’ve made carrot cake and carrot muffins and carrot cupcakes plenty of times. I’ve always tried to make them healthier by decreasing the sugar or replacing the oil with applesauce. There are lots of recipes out there that want you to add shredded apples or crushed pineapple. Those are all good, I’m sure, but I went for pure carrot this time. And let me tell you, I didn’t cut back on the oil or the sugar and I’m totally okay with that. They’re cupcakes, damnit! I made healthy gluten free carrot coconut pancakes with the rest of the carrots, so it all balances out, right? The next thing I did that ended up being wonderful was the frosting. 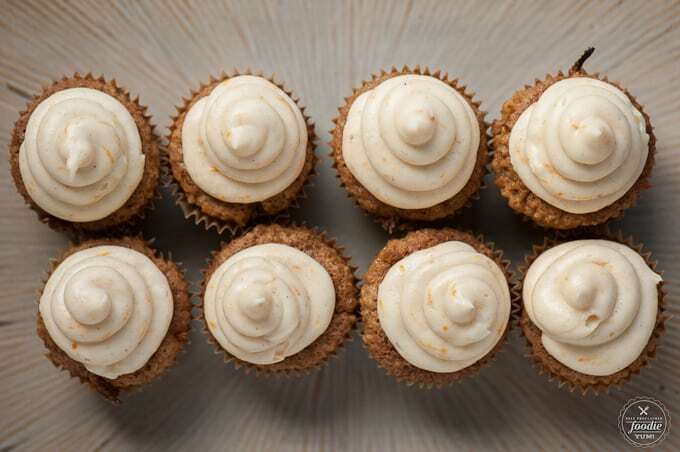 Everyone knows you have to have cream cheese frosting with carrot cake. They’re just made for each other. But I did things a little bit differently than your standard cream cheese frosting. First, I used half cream cheese and half butter. You may or may not already do this. Sometimes I go heavier on the cream cheese. Truth be told, I just didn’t feel like opening a new pack of cream cheese and I had exactly four ounces ready to go, so that’s what I did. Next, I added some orange zest. I found out how cook orange zest is with carrot and cinnamon when I made some super soft carrot sandwich cookies. Then, in both the cupcakes and frosting I used almond extract instead of vanilla. Just search for vanilla on my blog and you’ll know that I am obsessed with it and use vanilla in almost everything I make. So why didn’t you, Krissy? Well, let me tell you. I finally finished up my last batch of homemade vanilla extract and am ready to crack open the next gallon that’s been soaking a healthy amount of Mexican vanilla beans in a gallon of vodka for 15 months. The problem was that I couldn’t get the damn lid off and the husband wasn’t home. I’m actually grateful I couldn’t open it because the almond extract made these especially spectacular. I also used pumpkin pie spice instead of cinnamon. If you have it, use it, otherwise cinnamon will due just fine. 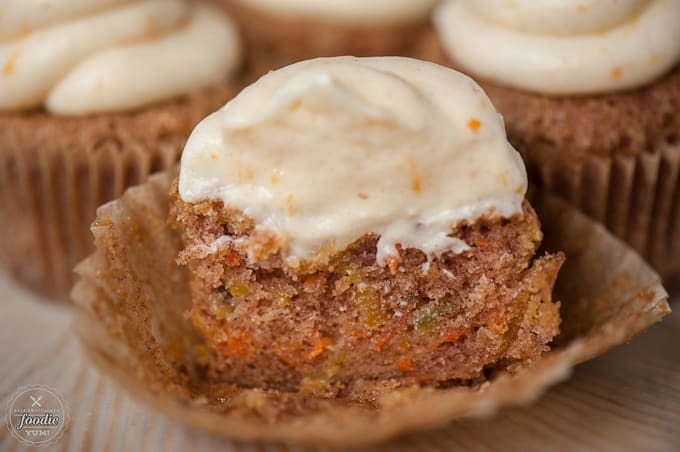 Now, if you have a keen eye, you’ll see all sorts of different colored carrots in my cupcakes. That’s because I buy the multi-color pack at Trader Joe’s for the simple reason that all those colors make me extra happy. I’m weird, I know. This is one of those recipes that I really don’t want you to take my word for it. You must make them to see how wonderfully delicious they truly are. Preheat oven to 425 degrees F and line 12 cupcake wells with paper liners. In a small bowl, combine flour, baking soda, cinnamon, and salt. Set aside. In the bowl of a stand mixer, combine eggs, oil and sugar. Mix on medium high speed until light and fluffy, about 5 minutes. Add almond extract and mix until combined. Add flour and fold mixture together just until mixed. Fold in shredded carrots. Fill all 12 paper liners with batter. Bake at 425 F for about 5 minutes, then reduce heat to 350 degrees F and back until golden brown on top and a toothpick inserted comes out clean, about 20-25 minutes total. As soon as you remove them from the oven, transfer them to a wire rack to cool. 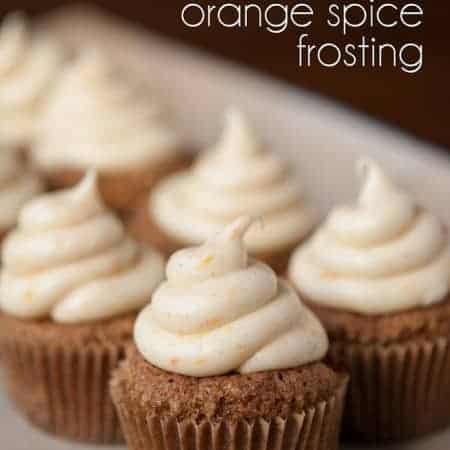 To make frosting, blend butter and cream cheese together on high speed until light and fluffy, about 5 minutes. Scrape sides, add zest, cinnamon, and almond extract, and mix until combined. Add sugar incrementally, blending slowly to combine and then on high speed to really mix. 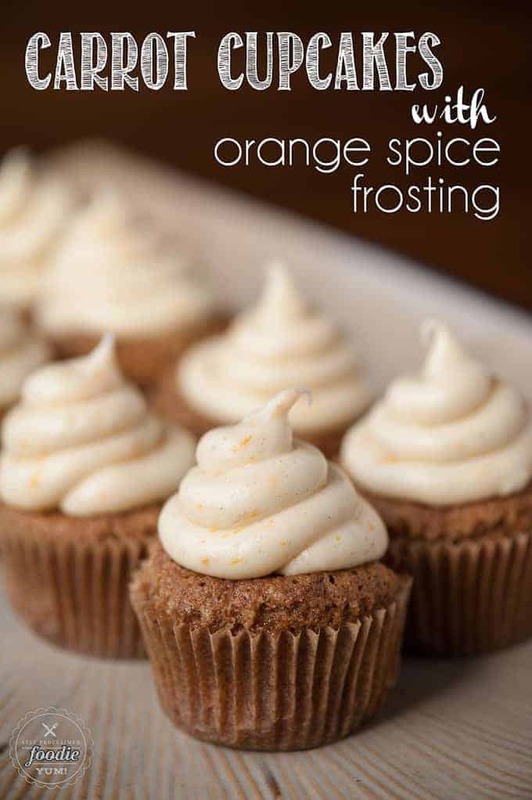 You can frost 12 cupcakes with a thin layer or 8 cupcakes with a big mound of frosting. This looks amazing! What kind of sugar did you use and how much? Thanks for fixing recipe! I guessed on confectioners sugar and amount since it wasn’t listed and was right! Cupcakes were a hit at our Easter dinner! Definitely saving for future use! Your frosting instructions indicate “add sugar incrementally…”, however the ingredients under “frosting” do not list any sugar. Disappointing as I am making these presently for Easter dessert. Pls email me sugar type & amount for frosting.